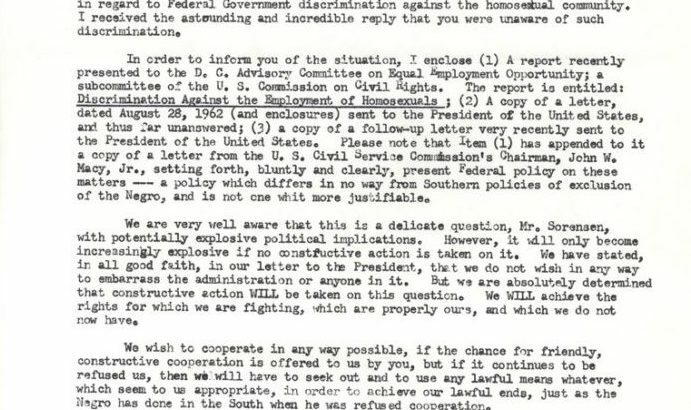 With the launch of the National Archives video for the It Gets Better Project, we’re spotlighting documents on the history of the LGBT rights movement from the collections of the John F. Kennedy Presidential Library. 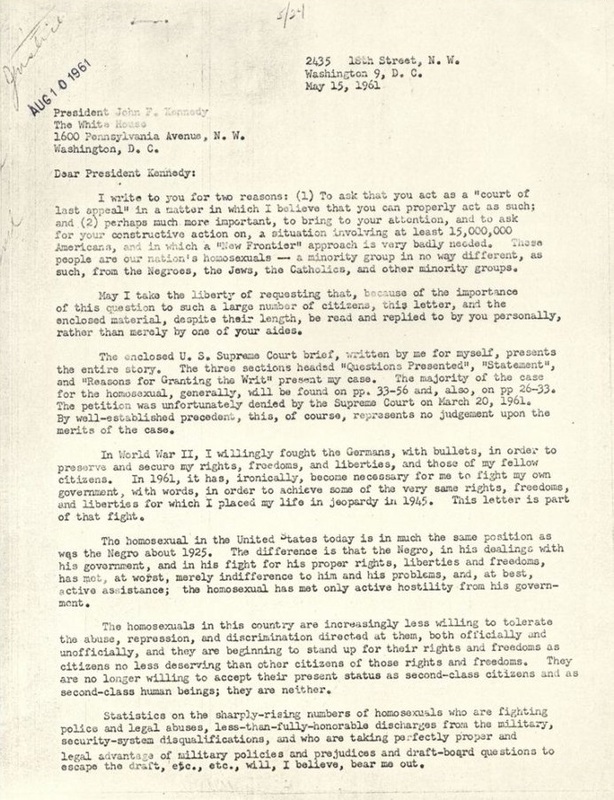 In 1953, President Dwight D. Eisenhower signed Executive Order 10450, which barred people with a history of “criminal, infamous, dishonest, immoral, or notoriously disgraceful conduct,” including “sexual perversion,” from serving as employees of the United States government. That year, a young World War II veteran named Frank Kameny was working on his Ph.D. in astronomy at Harvard. In July 1957, he was hired as an astronomer for the U.S. Army Map Service – the work, he later wrote, he had hoped to do since he was seven years old. 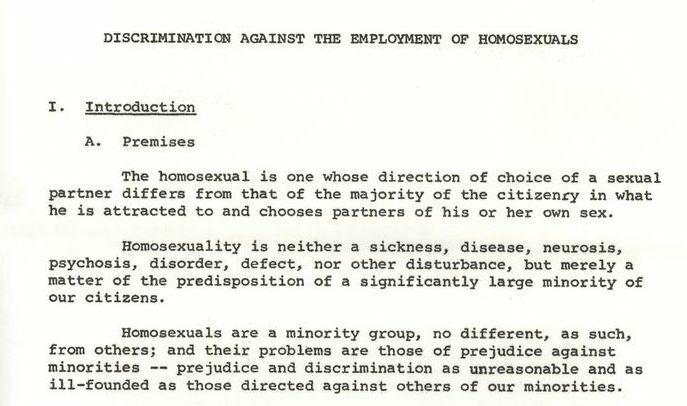 But by 1958, the U.S. Civil Service Commission had fired and banned Dr. Kameny from federal service after investigating him for homosexual activity in violation of E.O. 10450. He appealed his firing through federal courts, losing twice; his appeal eventually reached the U.S. Supreme Court in 1961. The Court refused to review his claim, but Kameny made history by bringing the case – the first civil rights claim based on sexual orientation – to the Supreme Court. 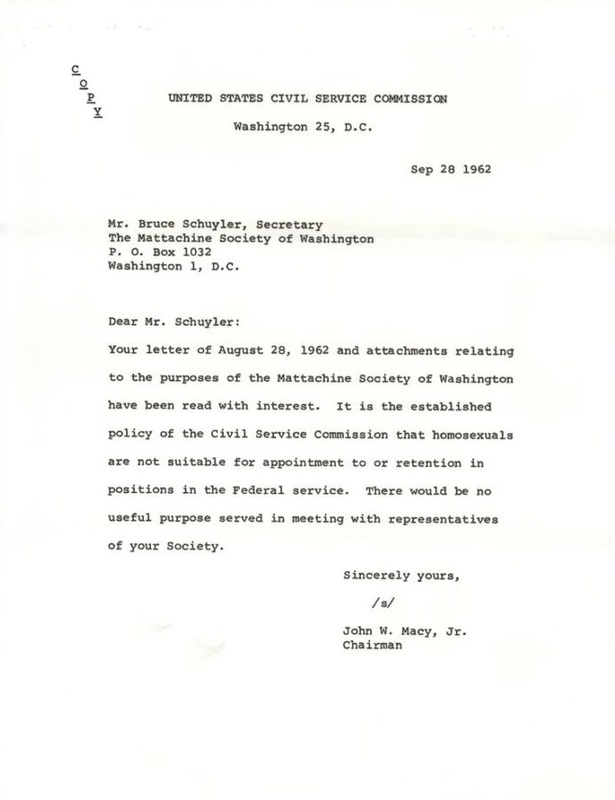 It is the established policy of the Civil Service Commission that homosexuals are not suitable for appointment to or retention in positions in the Federal service. There would be no useful purpose served in meeting with representatives of your Society. Though Kameny passed away in 2011 without ever working as a professional astronomer again, he remained an outspoken leader in the LGBT rights movement for the rest of his life. In 2012, an asteroid was named after him as a posthumous honor both to the scientific career he might have had, as well as to his noteworthy contributions to civil rights in the United States. Things have gotten better and we have many records here to prove just that. The winds of change are blowing. A wise and foresighted government will start NOW to take constructive action on this question. Things have changed. How they have changed. I am honored and proud that it is so. 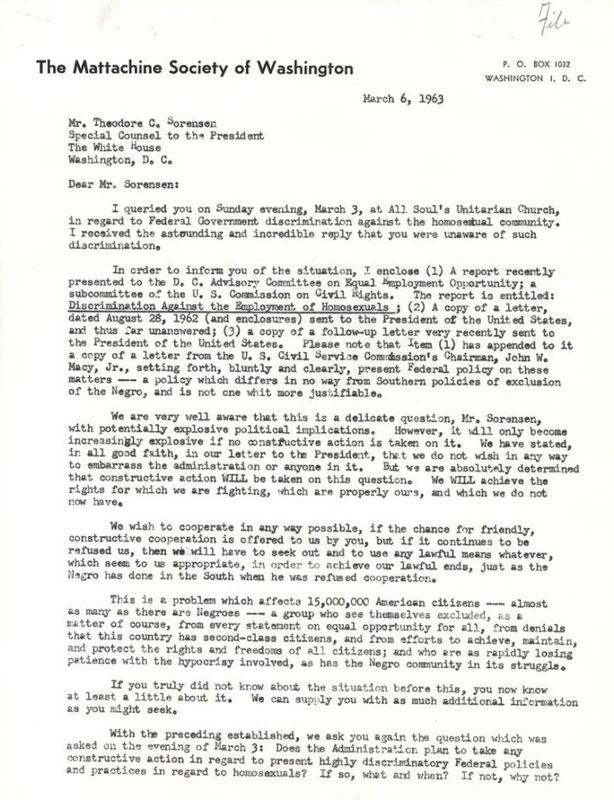 Note: Check out all of Frank Kameny’s letters from the White House Central Name File in our digital archives. We also invite you to watch the National Archives’ contribution to the It Gets Better Project. With thanks to Charles Francis, founder of The Kameny Papers project.